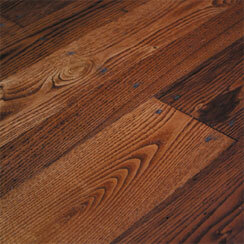 This commercially extinct flooring is known for its unique grain pattern and warm color. 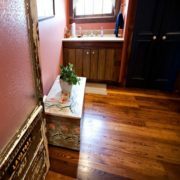 Popularly known as “wormy chestnut”, the blight of the late 1800s has given our chestnut flooring beautiful character along with tiny “worm” markings. Anyone viewing your chestnut flooring will be certain that you own a piece of history! This flooring is 3/4″ thick with tongue and groove, 3″-7″ (with wider widths available), random width and 3′-14′ long, random length.